One of the biggest wildcards since The Passion of the Christ is set to land on theaters this weekend, in what's an otherwise vacant Halloween period. Any number of records seem vulnerable to fall, but exactly which ones, and by how much are still up for debate. Almost lost in the supreme weirdness surrounding the recent death of Michael Jackson was that he was in the works to begin a 50-date concert series in London, his first in years after going into semi-seclusion. 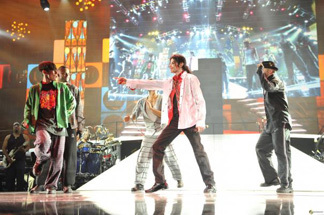 Shortly afterwards, it was revealed that extensive rehearsal footage had been taken, and the producers of the series planned to edit that into a concert film, trying to milk that last drop out of Jackson's estate. The film bears the same name as the concerts would have, This Is It, a title that's taken on a darkly ironic meaning since then. This truly is all the Michael Jackson we'll get from now on, whether you want it or not (but then – Tupac, John Lennon, Freddy Mercury and Elvis have all released new music since their death, so you never know). It's macabre, but there's no way this film happens if Jackson is still alive. Judging just what the popularity of this will be is a tricky thing. Concert movies have never been among the higher grossing genres, with usually just special events and flashes in the pan (you heard me, Jonas Brothers! Oh, I'll take on anyone) finding their way into the top 10s, so there's little to compare this to. Jackson's music underwent a bit of a surge following his death and probably would have given him a number one record for at least a week if Billboard didn't have rules against old albums doing that. It's safe to say there's still some demand for this and enough people who aren't weirded out by Jackson himself (how?) to still be fans. Some screenings have sold out months in advance. So, records. It's already set one for October with $2.2 million on Tuesday night, but the competition for that one is rather lacking. The biggest record for a concert film is the Hannah Montana Best of Both Worlds (I still can't believe that title got approved) movie, at $31 million (and $65 million total, to give you an idea on the shelf life of these films), which seems like our first significant record to fall. The opening weekend record for October is held by Scary Movie 3 at $48 million, which, if studio press releases can believed, would be a disaster if it wasn't broken by This Is It.